Glassy Baby trunk show this Thursday in Manhattan Beach! 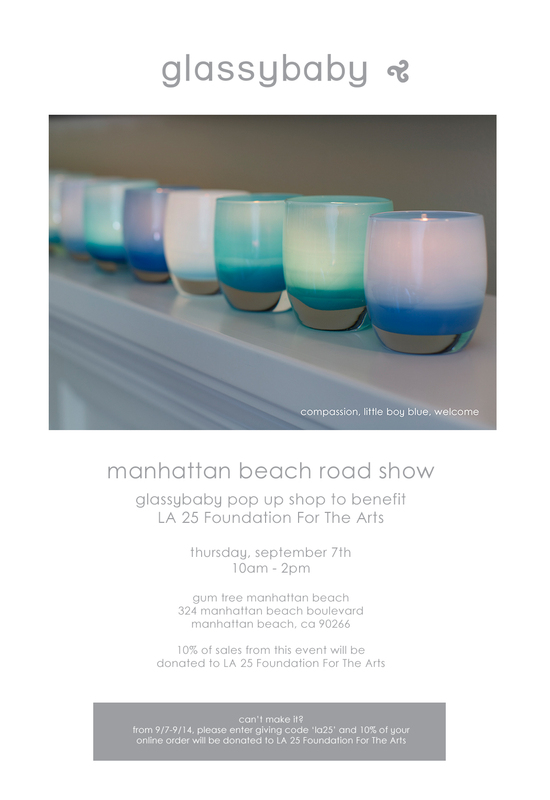 I hope you can join us for a trunk show This Thursday in our Manhattan Beach shop with Glassy Baby benefiting The LA25 Foundation for the Arts. Glassy Baby began when the light of a candle in hand-blown glass gave hope to Lee Rhodes. This hope helped her heal from cancer three times and inspired a business devoted to giving hope, beauty, kindness, and millions of dollars to help people, animals, and our planet heal. Their hand blown glass votives are only available online, but you can come see them in person with us during this trunk show only from 10-2 Thursday. This amazing company donates over $2,000,000 a year to charity! This particular cause is near and dear to me. This year I am the Co-President of the non profit, LA25 Foundation for the Arts. We are a group of South Bay business owners who have come together to raise money for arts education for kids in the South Bay, primarily with our upcoming art auction ART310. We will be selling tickets at the event Thursday, but you can also click below and buy them now! It’s going to be a wonderful event, trust me, it’s always a good time. Huge thanks to Holly Socrates, talented local artist and our curator, and to all of the generous sponsors and artists who donate to the cause!